by Josué Sanchez Cerron, Peru. 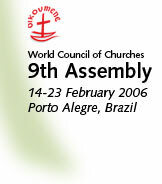 The theme for the World Council of Churches (WCC) 9th Assembly, to be held in Porto Alegre, Brazil 14-23 February 2006, invites us to return to, and re-appropriate, the resources of prayer. In the Bible, prayer is infused into the partnership between God and human beings. To pray is not, hence, to shift responsibility to God but to prepare ourselves for the tasks in partnership. To pray in truth is to be willing to work alongside with God in addressing the issue we pray for. Prayer that dodges partnership and escapes responsibilities is magical, not spiritual. The world matters to God (Jn. 3:16) and should matter to us. We are required to deny ourselves (Mt. 16:24), not the world. Only those who deny themselves can become partners with God in transforming the world. But transforming the world cannot be an unaided human agenda. God formed the world, which has been deformed by human rebelliousness. The theme recognizes that we cannot transform the world by ourselves while, at the same time, we are not irrelevant to the transformation of the world. Only the One who has formed the world can transform it. Yet God, in His humility, invites us to be partners in this supreme enterprise. To be partners with God in this spiritual mission, we need to become a new creation (2 Cor. 5:17; Jn. 3:3). Physicians must, first, heal themselves! Blessed are the change-makers. Transformation seems a desperately difficult task. Why is this so? This stems from our resistance to transformative changes. We take readily to degenerative changes but are cynical about changes towards regeneration. The willingness to change is essential if we are to become agents of transformation as well as be transformed. It cannot be that we, like the rich young man (Mt. 19:16-22), want to be transformed but are unwilling to change! Confessing and repenting this contradiction innate in human nature is central to the theme of the Assembly. The authentic sign of spiritual vitality is the willingness to welcome change, especially change that goes beyond the passions and preferences of human nature or expediency. Human responsibility under the spotlight. All is not well with the world. But merely arriving at a diagnosis on what ails the world and denouncing its many maladies are insufficient. Spirituality is a domain of responsibility (Jn. 21:15-19). What makes a response truly spiritual is not only the clarity of the diagnosis on what is wrong, but also the eager commitment to improving the situation. It is not enough to denounce, we must also be able to announce "a new heaven and a new earth". It is easy to find fault, but what the world needs are solutions to its ever-multiplying problems. Biblically, we are the solution-bringers that Jesus sends out to the world. This is the meaning of 'outreach'. Outreach is, hence, a dominant nuance of the theme. Transformation and God's priorities. The effective implementation of an agenda calls for an appropriate strategy. To strategize is to set priorities. In the context of the theme, this means to accept God's priorities. Biblically, these priorities include the transformation of the individual and the sanctification of the family. 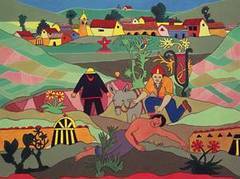 At the society level, this entails the reorientation from expropriation to sharing, from hostility to hospitality. The outcome of such a reorientation should be "fullness of life" for all and a world order amenable to the core spiritual values of love, compassion, truth and justice. As far as religion is concerned, a reorientation of religiosity from its preoccupation with life after death to the spiritual duty to be perfect in this world is needed (Mt. 5:48). Imploring God to transform the world would sound insincere if we disown the need to reform our religiosity. Religion needs to be transformed into an instrument for eradicating alienation, rather than aggravating it. Purifying religion was a priority in the public ministry of Jesus. From the escapist religiosity of "looking the other way" (Lk. 10:31-32), we need to be re-oriented to the pro-active spirituality of the Good Samaritan who has eyes to see and a heart of compassion to respond to human needs. (*) Rev. Prof. Valson Thampu, from the Church of North India (CNI), is a theologian, academic, and author from New Delhi, India. He serves on the National Commission for Minority Education as well as the National Integration Council.